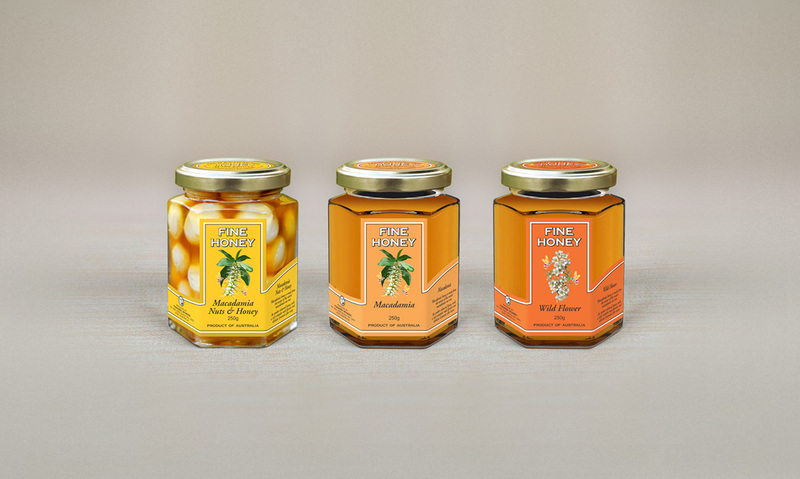 Create packaging and brand recognition solution for a range of culinary honeys. Retain “local” produce feel while presenting the products with cohesion. Facilitate different product sizes with a view to presenting all products in a single package aimed at the Tourist Market. 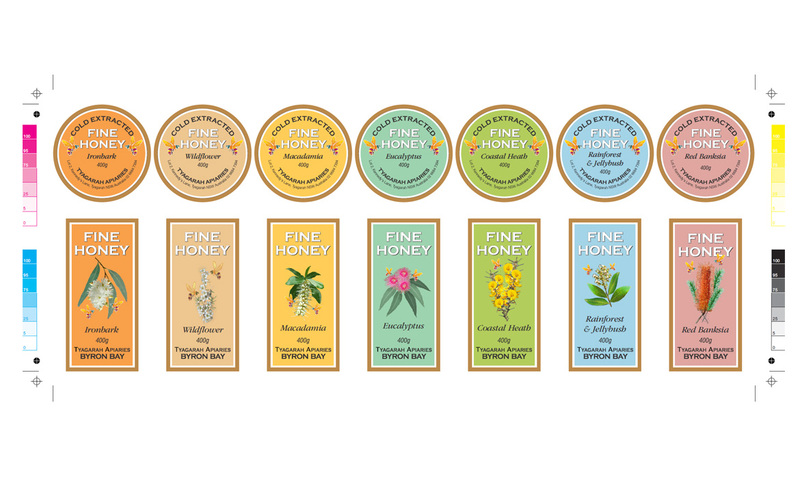 These mock-ups were created for Tyagarah Apiaries and represent a work in progress; the aim of which is to present their extensive range of premium culinary honeys to consumers in Australia and abroad. Master Apiarist, Michael Howes and I worked closely together to determine the best colour scheme for seven different flavours of honey, including Ironbark, Wildflower, Macadamia, Eucalyptus, Coastal Heath, Rainforest & Jellybush and Red Banksia. A very interesting aspect of this project relates to the sequence that the various flowers bloom through the seasons and the tendency for bees to forage only one kind of flower approximately following that sequence. Michael also mentioned that in his experience, the various trees and shrubs flower in approximate order of colour through the spectrum; warmer colours in Spring and Summer then gradually moving to cooler colours in Autumn and Winter. This served as inspiration for the colour coding of each lable and our preference was for pastel tints to retain a local, traditional or “home made” feel. The flower illustrations (where possible) were derived from photos of the actual flowers on-site at Tyagarah Apiaries harvesting areas at various locations around Byron Bay and North Coast New South Wales. They were deep etched, recomposed and filtered in Photoshop to mimic water colours. This saved considerable expense that may have been born from hand illustrations and also gave us the flexibility to adjust each composition “on the fly”.